This popular North Norfolk Coast hub, is looking for high quality vendors to feed & water the visitors, who are shopping and browsing at the fantastic shops. "Sadly Deepdale Café will be closed for the winter, with the departure of the tenant. But the great shops and friendly staff of Dalegate Market are still there, welcoming visitors throughout the year, particularly for Christmas shopping. To replace the café while it’s closed for a refit, we are looking for pop up cafes and street food vendors to join the shops." said Jason Borthwick, Landlord and marketer of the site. The winter on the North Norfolk Coast is always a wonderful time, starting with the run up to Christmas and then the big skies and incredible wildlife that is free to enjoy through January, February and into March. Whether its winter clothing or wildlife watching equipment, the shops at Dalegate Market can kit you out for your visit to the North Norfolk Coast. "The run up to Christmas will be great. 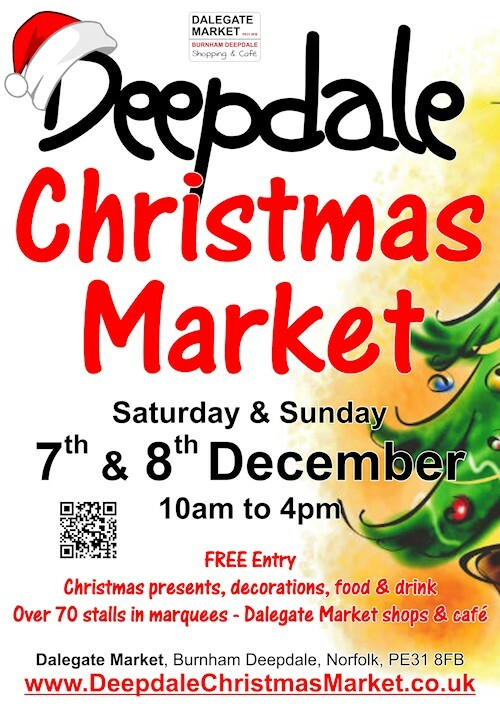 Starting with Deepdale Christmas Market this weekend (Saturday 7th & Sunday 8th), then themed shopping weekends through until Christmas itself and a Late Night Opening Christmas shopping event on Tuesday 10th December." continued Jason. "There's loads of great food & drink at the Christmas Market, we've created a food court with an indoor seating area that will be heated. Then Hushwing Cafe will be joining us for the following two weekends. We are looking for a partner to join them and filling up weekends after New Year through January, February and March." Interested food stalls should apply on the Dalegate Market website - www.dalegatemarket.co.uk - There is a simple form to fill out and the Dalegate team will then produce a great programme of wonderful food & drink throughout the winter. Stalls need to be self-contained, they can be supplied water and electricity. There will be seating both inside the cafe building and outside by the shops, so plenty of room for customers to enjoy the fayre available. Advertising for a new cafe tenant at Dalegate Market will begin before Christmas and it’s hoped the cafe will be back up and running for April. There are plans for a refit and the cafe will return to being 'a cafe'.